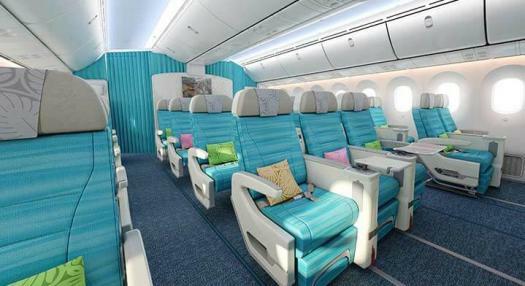 Air Tahiti Nui today introduced its new Boeing 787-9 Dreamliner cabin layout in the Global Distribution System (GDS) for worldwide distribution and sales. In 2015, the flag carrier of French Polynesia finalized a purchase order for two 787-9 Dreamliners and the lease of two additional 787-9s through Air Lease Corporation. The new “Tahitian Dreamliner” will be available starting November 2018 on its first flights between Tahiti and Auckland, New Zealand. The phasing out of Air Tahiti Nui’s current Airbus A340-300 fleet will commence in November 2018 and be completed by September 2019, coinciding with the airline’s 20th anniversary. With the introduction of the airline’s first Premium Economy product, travelers will discover the many benefits of the new three-class configuration (Economy, Premium Economy and Business Class). ZODIAC Aerospace is providing the airline’s new Z535 Premium Economy class seat as well as the new Z300 Economy class seat. The MOANA Premium class will offer a more comfortable flying experience with extra leg room and relaxation space. The Z535 seat features a unique recline motion that cradles the passenger while optimizing living space. The 20.4 inches wide seats are installed at a pitch of 38 inches and offer a recline of 8 inches. The dedicated cabin will feature a total of 32 seats configured in five rows on a seven-abreast (2-3-2) arrangement. 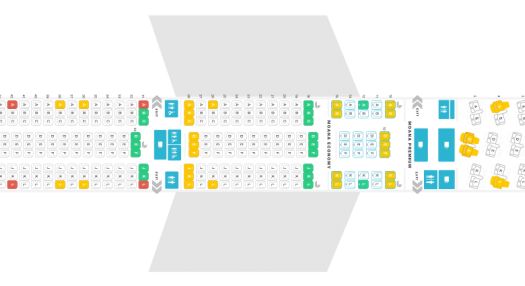 The two Moana Economy class cabins will feature a total of 232 seats specially designed for long-haul travel, on a nine-abreast (3-3-3) configuration. The Z300’s articulating seat pan makes it one of the best next generation long-range economy class seats available in the industry. The economy class seats will be installed at a pitch of 31 inches offering a seat recline of 6 inches for improved comfort. Air Tahiti Nui is also providing further enhancements in its famous Poerava Business Class, including the introduction of a 180-degree full-flat seat designed by Rockwell Collins. The Parallel Diamond, designed to optimize space, includes a wide range of storage areas to accommodate today’s business class traveler. 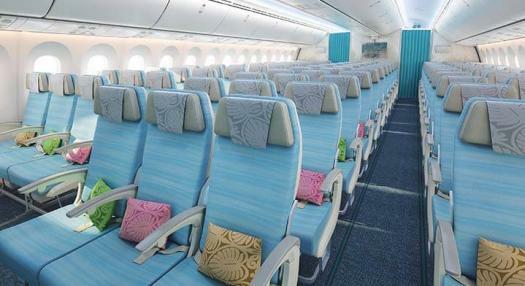 The cabin will feature a total of 30 seats configured in five rows on a six-abreast (2-2-2) arrangement. Installed at a 60 inches of pitch, the new business class product moves into a fully flat 78 inches bed for sleeping. Each seat is equipped with a luxurious cushion and cover comfort system for restful travel. The updated business class seats also offer a touch screen remote control, inflight entertainment system, personal lighting and privacy divider. 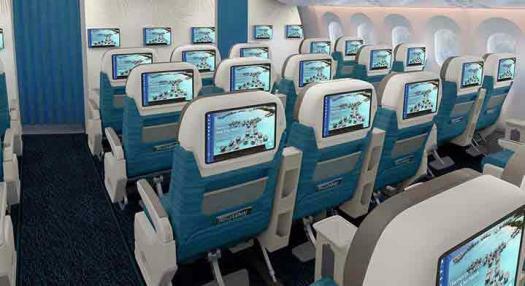 The “Tahitian Dreamliner” will be equipped with Panasonic’s most advanced Inflight Entertainment (IFE) system in operation today. The eX3 solution offers unmatched performance and reliability bringing Audio Video on Demand (AVOD) to every seat through multi-touch screens, ensuring that every passenger enjoys an immersive and entertaining experience while onboard. Business class seats will be equipped with 16-inch screens, Premium Economy will feature 13-inch screens and Economy class will have 12-inch screens, matching the airline’s current Business class screen size. As part of this new partnership with Panasonic Avionics Corporation, guests will be able to stay connected with Panasonic’s eXConnect satellite broadband during the airline’s short- and long-haul flights from Los Angeles, Paris, Auckland and Tokyo to Tahiti. Additionally, high speed internet will be accessible directly with the in-seat system and via PDA through onboard Wi-Fi. 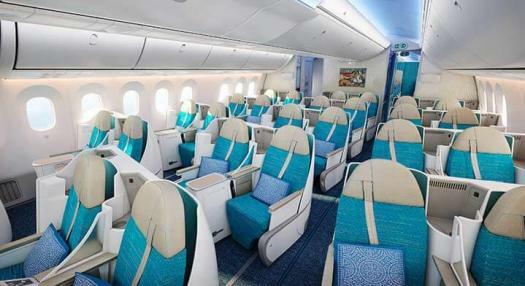 The cabins of the Dreamliners will be completely redesigned to offer a stunning new look that is distinctly Tahitian. Air Tahiti Nui’s inspiration lies in the beautiful Islands of Tahiti and its people, which inspire the airline to create a remarkable and engaging customer experience that transcends the cabin reality, so that a trip to Tahiti starts from the moment you step on board the aircraft. 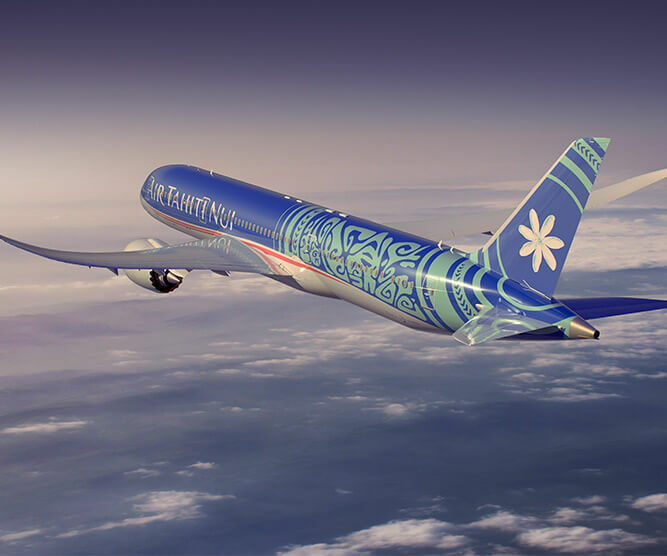 As Air Tahiti Nui approaches its 20th anniversary, customers can look forward to more exciting news on the new “Tahitian Dreamliner”. Air Tahiti Nui is the first international airline based in Papeete, Tahiti. Created in 1996, the company operates from its Tahiti Faa’a International Airport with a fleet of Airbus A340-300 towards Paris-CDG, Los Angeles, Tokyo and Auckland-NZ. In May 2015, Air Tahiti Nui has announced the renewal of its entire fleet with four Boeing 787-9 Dreamliners, which are due to be delivered in 2018 and 2019. 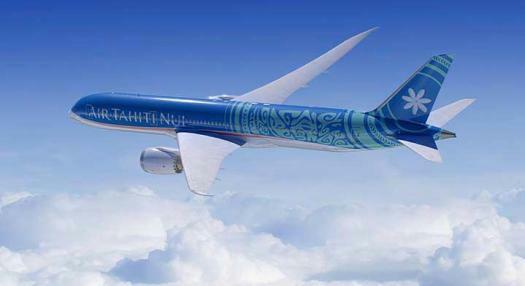 For more details, please visit www.airtahitinui.com. World leader in aerospace equipment and systems on-board commercial, regional and business aircraft as well as helicopters, Zodiac Aerospace is also a key player in air safety and teletransmission. It develops and manufactures state-of-the-art solutions to improve on-board comfort and living conditions, as well as high-technology systems that boost aircraft performance and enhance flight safety. Zodiac Aerospace’s technological expertise is based on two core business lines: Aircraft Interiors that gathers Cabin and Seats segments, and the Systems activity composed of the Aerosystems segment. These segments develop solutions for aircraft on-board comfort, on-board systems, and safety on-ground and in-flight, supplemented by the dedicated after-sales business of Zodiac Aerospace Services. Altogether, the Zodiac Aerospace businesses employ 35,000 people worldwide and work with clients throughout the world, offering a comprehensive range of products and services. Since February 2018, Zodiac Aerospace is a Safran company. For more information, please visit www.zodiacaerospace.com. Panasonic Avionics Corporation is the world's leading supplier of inflight entertainment and communication systems. The company's best-in-class solutions, supported by professional maintenance services, fully integrate with the cabin enabling its customers to deliver the ultimate travel experiences with a rich variety of entertainment choices, resulting in improved quality communication systems and solutions, reduced time-to-market and lower overall costs. Established in 1979, Panasonic Avionics Corporation, a U.S. corporation, is a subsidiary of Panasonic Corporation of North America, the principal North American subsidiary of Panasonic Corporation. Headquartered in Lake Forest, California with over 4,100 employees and operations in 80 global locations, it has delivered over 8,000 IFE systems and 1,000 inflight connectivity solutions to the world’s leading airlines. For additional information, please visit www.panasonic.aero.